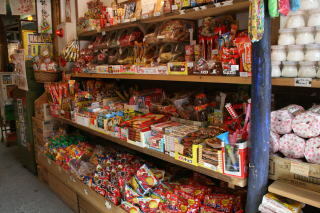 Wholesale District of Popular Cheap Sweets called "駄菓子/DAGASHI"
In Nishi-ku, there is a wholesale district of cheap sweets called "Meido-cho Kashi Tonya-gai/明道町　菓子問屋街". but "Meido-cho" still remains as a name of the intersection and bus stop. and cheap toy stores (ex. bubble soap kit, water gun, etc.). 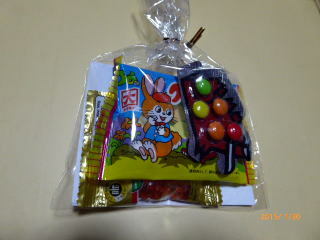 If you would like to buy cheap sweets in bulk, Meido-cho is one of the best places in Japan. Even if you don't want to buy, touring this area must be fun to feel nostalgia. 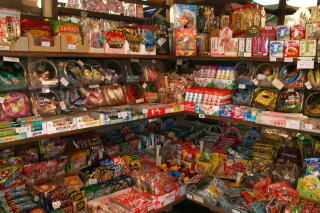 holiday/10:00-16:00 Sunday They have over 1500 kinds of cheap sweets. Get off at Sengencho 浅間町 Sta. on the Tsurumai Subway Line.